BY PATRICK VEREL ON JANUARY 23, 2018 for Fordham News. To attend school is to soak up new knowledge. But for children who are distracted by what awaits them at night, retaining facts during the day is a major hurdle. Thanks to a new app created by Fordham’s Graduate School of Education (GSE) and Department of Computer and Information Sciences, parents of children who are in distress will have an easier time finding resources in New York City. The app is being introduced to three Bronx Community schools that have partnerships with the GSE. It will provide the schools’ social workers and guidance counselors with quick access to services that parents might need if their children are facing domestic challenges—an eviction, or other household unrest. “If a child has pressing problems—say they spent a night in a shelter, or are living in an abusive situation—they’re not exactly going to be the first one raising their hand to answer questions,” said Anita Batisti, Ph.D., associate dean for educational partnerships at the GSE. “Do they need a shelter that can accommodate a pet? Do they need shelters just for single mothers or for a family? Do they have health needs? The app offers more specifics than what we’ve been doing in the past, which is sending parents the contact person and hours for facilities,” Batisti said. 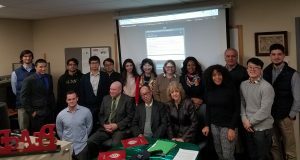 The app’s development began in 2015 with a $10,000 grant from Lilian Wu, Ph.D., a former member of the Fordham Board of Trustees and program executive for IBM Global University Programs. When former Board of Trustee Chairman John Tognino told her about Batisti’s partnership, Wu suggested they harness the power of the company’s Watson Blue Mix platform to help. “There are so many real-world problems that have a three-way piece to it,” said Wu, an expert on data analytics who delivered the Clavius Distinguished Lecture at Fordham in 2011. Front: Alon Yoeli, Ted Husted, Frank Hsu, Anita Vasquez Batisti. Back: Andrew Milligan, Sebastian Deossa, Jaffar Zaidi, Ruinan Chen, Jiacheng Chen, Anna Poulakas, Lilian Wu, Virginia Roach, Dawn Johnson Adams, Cesasina Javier, Bruce Wallach, Yuxiao Luo, Rafael Moure. Students working with Frank Hsu, Ph.D., Clavius Distinguished Professor of Science and Professor of Computer and Information Science, interviewed social workers and principals to get a sense of what kinds of questions the app would need to answer. Hsu’s Laboratory of Informatics and Data Mining has been conducting research on cognitive computing for several years using IBM Watson system through the cloud. Dawn Johnson Adams, the center’s director of the community school program at Community School PS85X,and Cesarina Javier, the center’s social worker, also worked closely with the staff of the school, just south of the Rose Hill campus, on the project. The school has 1,116 students who attend pre-k through fifth grade. Poverty is a significant issue; last year, 93 percent of students received free or reduced lunch. Many parents work two or three jobs, so she said that if they come to see her, they really need help because they’ve taken off from work. It’s hard to set up follow-up meetings to connect them to food pantries, mental health services, clothes, or the nearest emergency room. Nailing down accurate information quickly can be a challenge. “I’ve tried to help a family with food stamps. I called the general number, they gave me another number, and when I called that number, they told me to call the general number. You would be amazed how difficult the system is,” said Javier, who works as a bilingual social worker there. PS 85X principal Ted Husted said that things get particularly challenging when students, 16 percent of whom live in temporary shelters, are dealing with multiple issues at once. On top of an unstable housing situation, a student might have family member who is incarcerated or living in another country. He hopes artificial intelligence will be better at weaving all these issues together. The app is still in beta mode. And although it is designed to be a hyperlocal resource oriented toward specific New York City schools, Hsu and Batisti are hopeful that it will eventually be scaled up and expanded. “This kind of collaboration is what Fordham is striving for,” Hsu said.